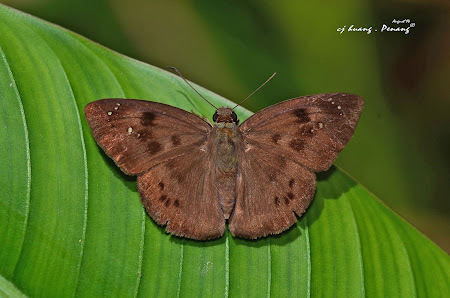 Amongst the skipper family Hesperiidae, there is a sub-family that features "Flats or Spread-Winged Skippers" - referring to the open-winged pose of the butterflies when at rest, or feeding. 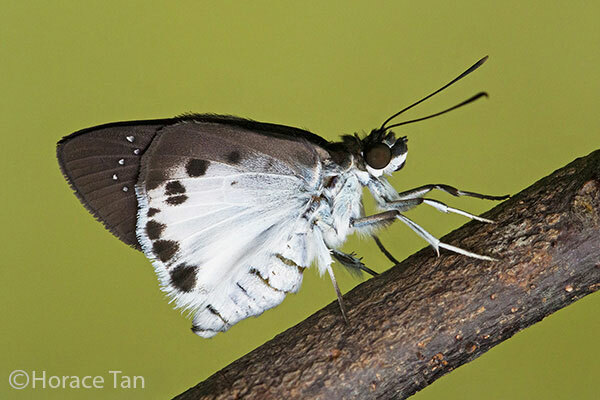 This sub-family, Pyrginae, is represented by 12 species in Singapore. 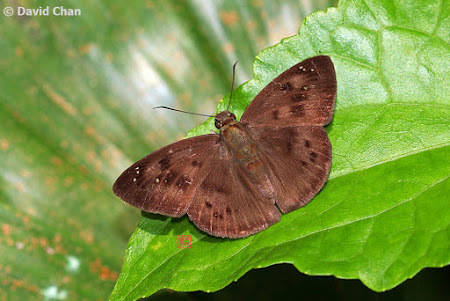 The majority of these species are considered rare, and a few of them were only discovered as recently as in 2011 and 2012. 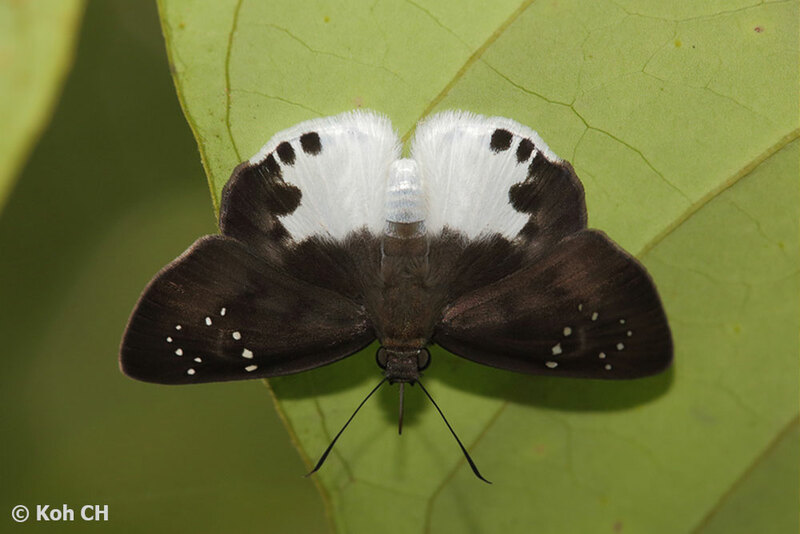 The "Flats" are swift flyers, and has a unique behaviour of stopping under leaves in their typical open winged pose. When disturbed, the butterfly will zip off quickly to search for another leaf to settle on the underside to hide itself. 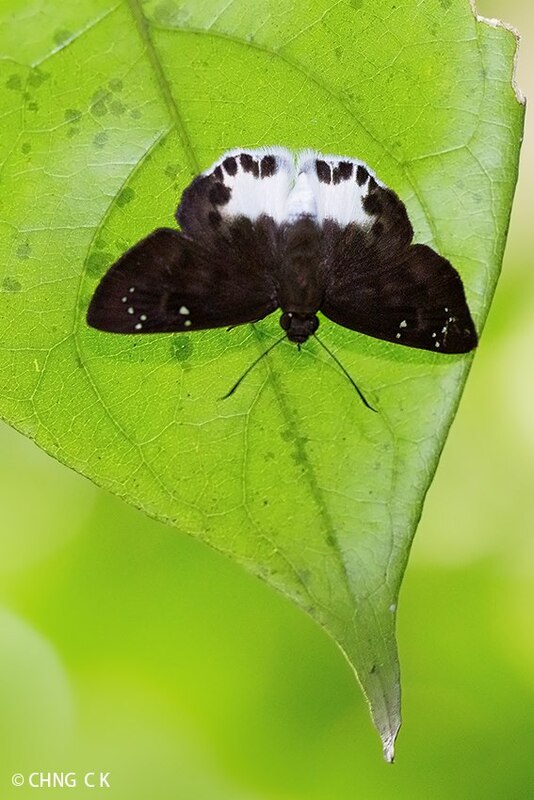 During certain hours of the day, several species are more likely to be observed settled on the upper surfaces of leaves to sunbathe. 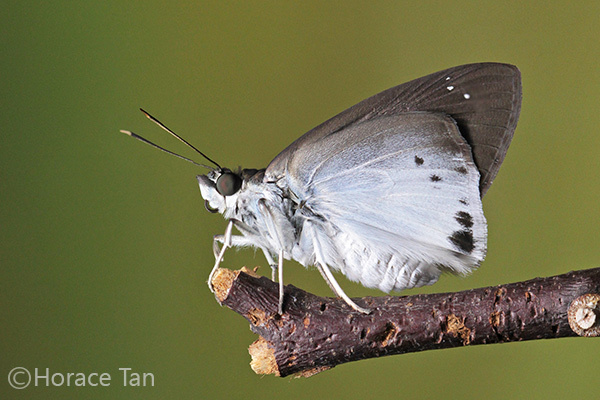 Even when feeding on flowers or puddling, these "Flats" maintain their open winged pose. 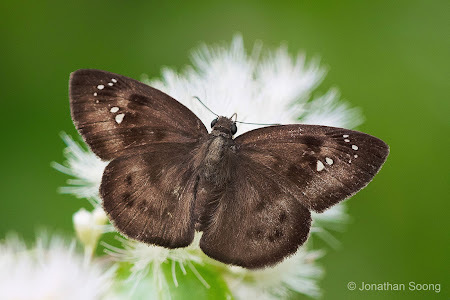 This weekend's blogpost discusses the four species of the Tagiades genus - collectively referred to by their English common name of "Snow Flats". The reference to "snow" in its name probably originates from the whitened tornal area of the hindwing and undersides of the species in the genus. 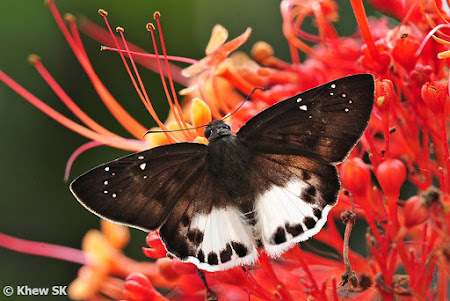 The whitened hindwings often give an appearance of a much smaller white butterfly zipping around the shrubbery when these butterflies are in rapid flight. Of the four species extant in Singapore, the Common Snow Flat is probably the most often encountered species. 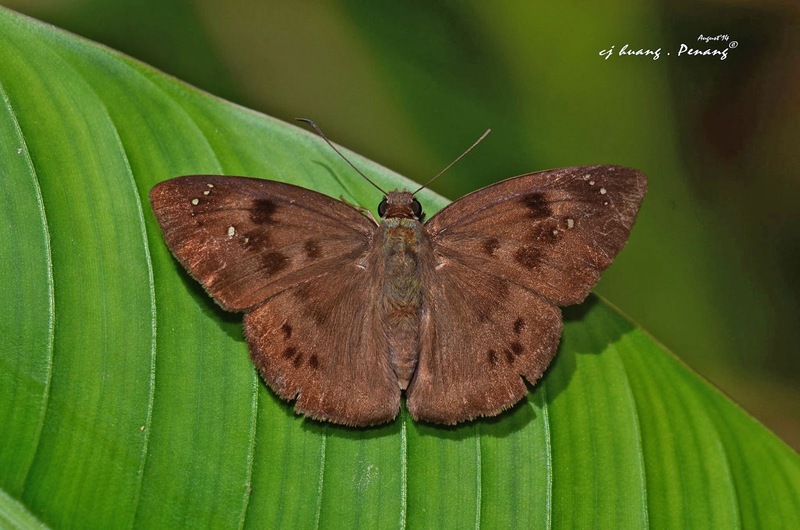 It is usually associated with the forested habitats in Singapore, where it is most active in the cooler early morning hours of the day. 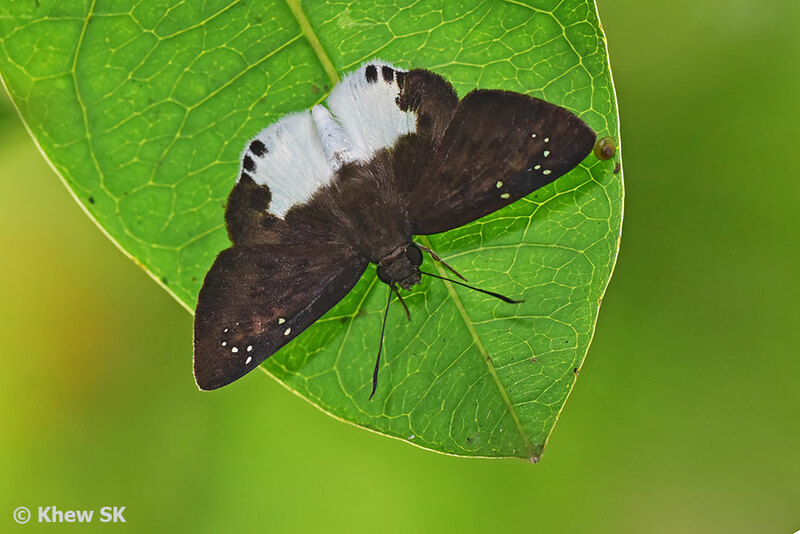 The Common Snow Flat is pale brown on the uppersides, with small hyaline spots on its forewings. 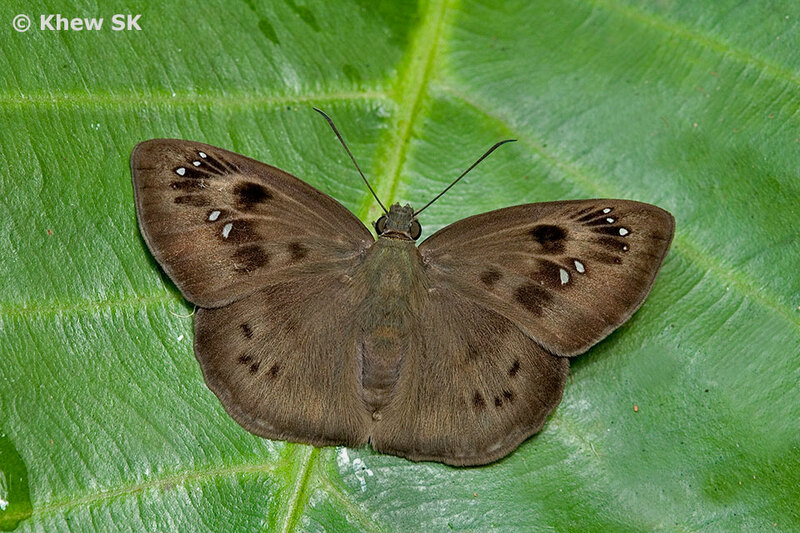 The are dark brown discal markings on the hindwing and a dark brown margin on both the fore- and hindwings. The underside of the hindwing is suffused with bluish-white scaling that may appear white in pristine individuals. 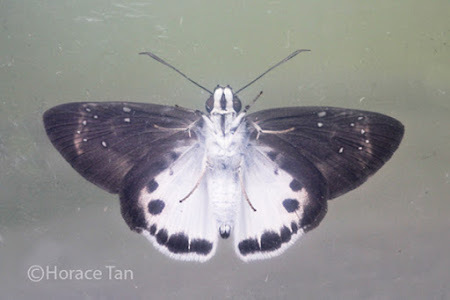 The Large Snow Flat is the next commonest species in the genus, although it is by no means considered a common butterfly in Singapore. It makes a regular appearance when flowering trees like the Syzygium spp. blooms. It also displays the usual habit of keeping its wings opened flat, even when feeding. The Large Snow Flat is dark brown on its upper surfaces with rather diffuse brown markings on its wings. 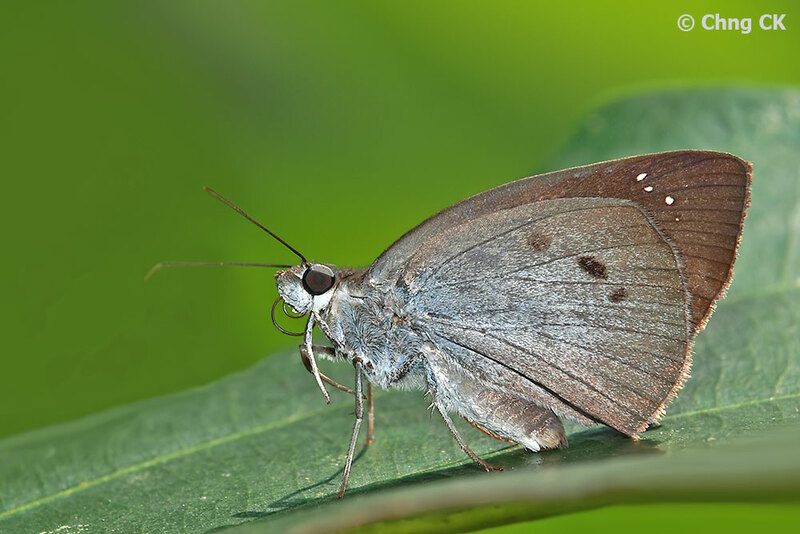 There are usually three hyaline sub-apical spots on the forewing. 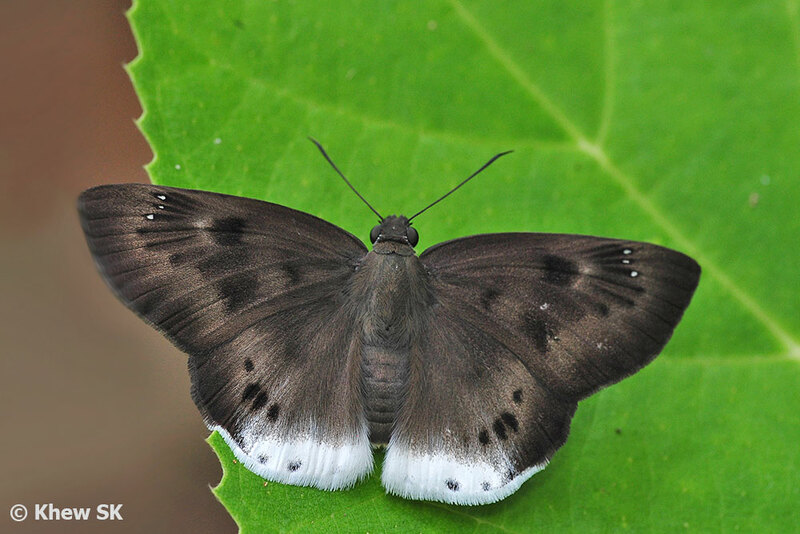 The tornal area of the hindwing is whitened and has small diffused black spots. 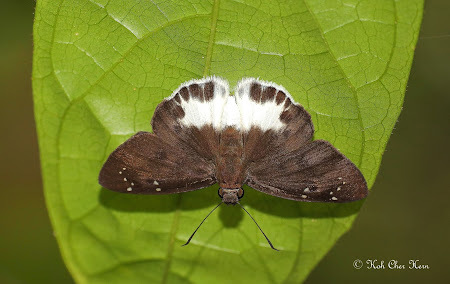 On the underside, the whitened area is more extensive and reaches the wing base of the hindwing. 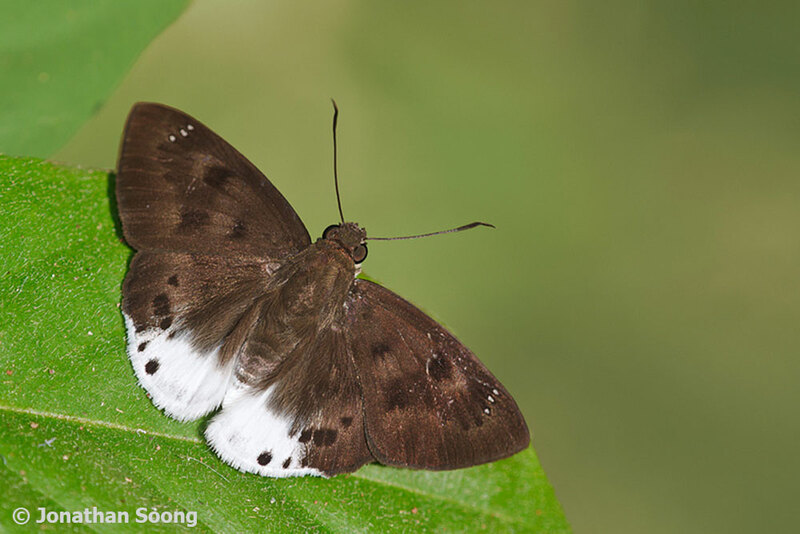 A relatively rare forest species, the Malayan Snow Flat also features a larger tornal patch on the hindwing that extends all the way across its mid-abdomen. The species is also a fast-flyer and exhibits the same habit of stopping with wings opened on the undersides of leaves to rest. It is usually seen in the early hours of the morning. 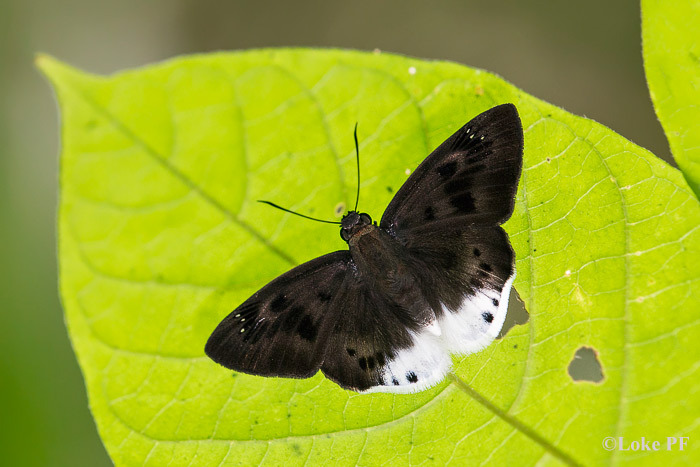 The Malayan Snow Flat is dark brown above, with the usual sub-apical and post-discal hyaline spots on the forewings. The hindwing tornal patch is pure white and contrasts with the dark brown wings. 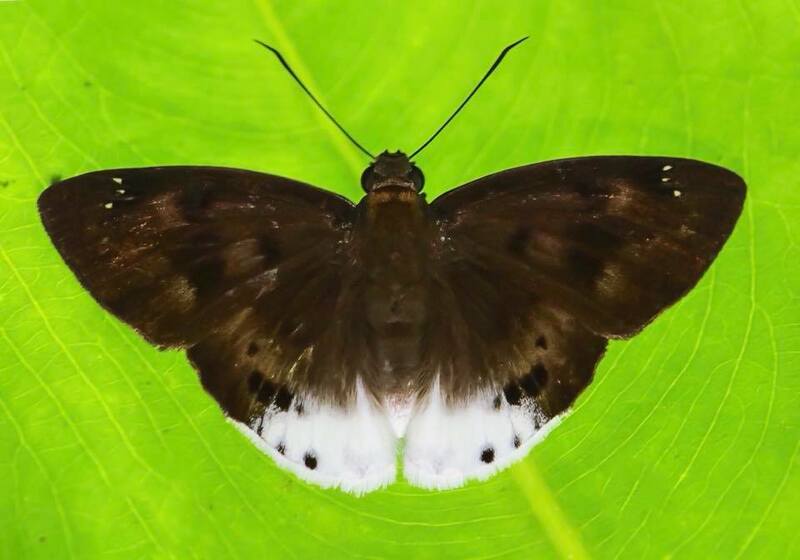 The whitened scaling is more extensive on the underside, covering most of the wing. 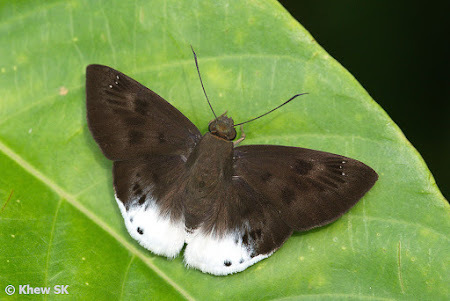 There are prominent black submarginal spots at the tornal area of the hindwing, but lacks the spot at vein 1b. This species was re-discovered in the late 1990's in Singapore after being recorded as extinct by the early authors. 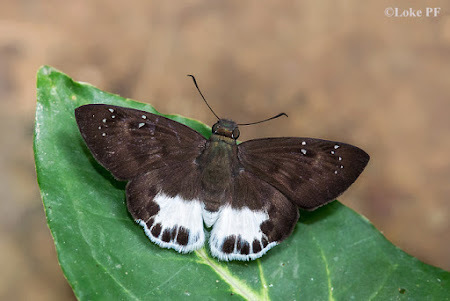 It is another rare species, and usually individuals are observed. 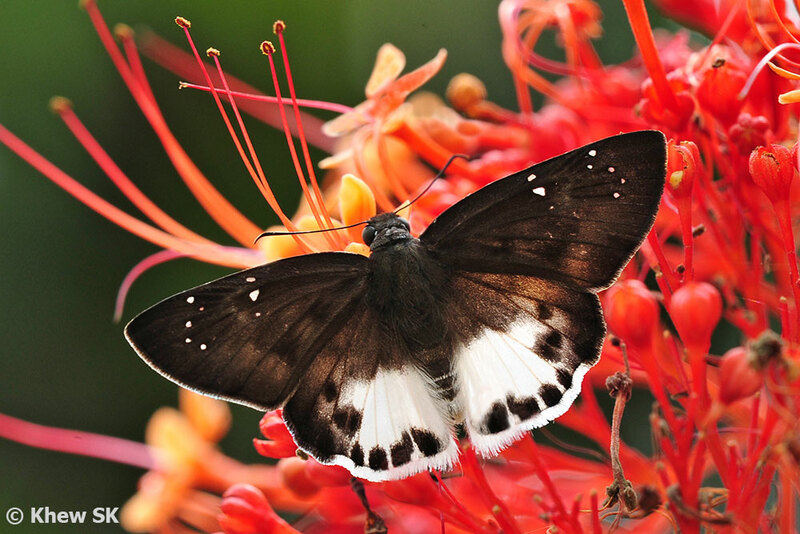 The butterfly is more active during the cooler hours of the day, and often seen feeding at flowering bushes or sunbathing in the morning sun. The Ultra Snow Flat is dark brown above with the typical hyaline post-discal and sub-apical spots on the forewing. Its general appearance is similar to the Malayan Snow Flat, except that it has four large prominent submarginal spots on the hindwing that are sometimes conjoined in some individuals. 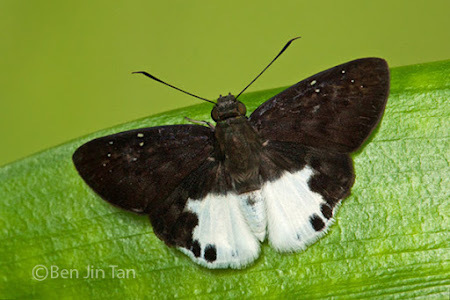 On the underside of the hindwing, the white is more extensive and reaches the wing bases.